Steven Spielberg's powerful 1993 film is one of the last modern classics to be released on DVD. With a running time of more than three hours, it was always going to present problems if it was to be released on DVD. The capacity of the format meant that either the picture quality would be compromised, in order to squeeze it onto one dual-layer disc, or it would have to be split across two discs. This would have been prohibitively expensive in the early days of the format, when mastering and duplication costs were substantially more than they are now. Now, with mastering costs tumbling as more competing companies enter the market, and with duplication costs falling as capacity has expanded exponentially, two-disc sets are becoming the norm for most key releases, rather than the exception. Other factors have helped, too. Compression techniques have improved, but there are still limits to what can be accommodated by a disc of five or nine Gigabytes. Long films, like Lawrence of Arabia, The Godfather Part 2 and Dances With Wolves, still demand to be split across two discs (or two sides of a dual-layer, dual-sided disc), if quality is to be optimised. It's not an ideal situation, but until a format offering much higher capacity is available, it's one we're stuck with. 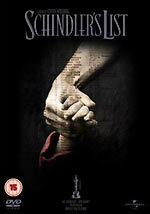 The UK version of Schindler's List is split across two dual-layer discs, with the first two thirds of the film on disc one, and the remainder, and all of the supplementary material, on disc two. Efforts have been made to minimise any disruption while watching the film. The second disc starts immediately with a simple menu, with the option to continue the film, or to go to the main menu. Annoyingly, to continue playing the film in DTS the user has to go through several menu screens to select the track, and then, amazingly, the DTS 'piano' logo is played again. It's easily-skipped, but it's an idiotic authoring decision. The average bitrate on disc one is a very respectable 7.49Mb/s. It's very slightly higher on the second disc: 7.67Mb/s. The film is presented in 1.85:1 anamorphic format. Most of the film is in monochrome, and the disc offers excellent contrast and good apparent detail. Shadow detail is outstanding, but the transfer needs to be watched in darkness to appreciate the cinematography and the fine transfer. There are the inevitable signs of artificial edge-enhancement here and there, but generally the picture quality is most appealing. The image is occasionally quite grainy, but this is film grain, not video noise, and is to be expected. The famous "red dress" sequence is presented with great subtlety, with the merest hint of colour. Other colour scenes, most notably the closing scenes, are vibrant, especially seen in contrast to Janusz Kaminski's haunting, Oscar-winning monochrome images. Film dirt, negative dirt, and other film-related flaws are present, but are generally insignificant. There appears to be a minor glitch at 45'40" on disc one, where the film seems to skip a frame or two. A few shots have negative tramline scratches, including the famous "the list is life" scene (approx 10m 20s into disc two). Another example, more prominent - but less crucial - crops up a few minutes later (at 12m 58s into disc two). It seems odd that Spielberg wouldn't have had these, and other minor blemishes, cleaned up for the DVD release. There are several scenes where woven fabrics or similar textures might create moiré patterning problems for viewers not using component connections. The layer change on the first disc (at 1h 02m 24s) occurs mid-shot, but it is not terribly disruptive (it's impact is reduced because there's virtually no sound at that point in the film). It should go without saying that some machines will handle the layer change better than others. The first disc ends (at 2h 08m 18s), just after Goeth (Fiennes) negotiates Schindler's release from captivity, after the line "That's not good old-fashioned Jew-hating talk, it's policy now"). It's perhaps not the ideal place to break the film, but it is considerately-chosen. The second part of the film is not interrupted by a layer change. The film has several burnt-in captions, used to establish various locations, and identify some of the characters. These have not been Anglicised (it's "labor camp", instead of "labour camp", for example). English HoH subtitles are offered. A spot check suggests that they are pretty thorough. The song playing during the scene where the ghetto is being evacuated is faithfully transcribed, as are instances of un-translated German and Polish dialogue, for example. The bonus materials on the second disc also have subtitles. The disc offers two audio options: a Dolby Digital 5.1 track (at 384kbps), and a DTS option (at 754kbps). The DTS track seems preferable, offering better separation and clarity. The disc does not support switching audio tracks on the fly (a feature that would have made the disc change much easier for DTS users). The audio mix is weighted to the front channels. It's a first-class mix, and very detailed, but, as you might expect, rarely showy. There is judicious use of .1 bass, and of the surround channels, but nothing too startling. John Williams' score, featuring the Boston Symphony Orchestra and violin soloist Itzhak Perlman, is given plenty of room to breathe. Disc two features all the bonus materials. Film fans will be disappointed that there's nothing substantial on offer which is about the movie itself. That may sound like a crass remark, but, as worthy as it indisputably is, Schindler's List is, in the immortal words of Alfred Hitchcock, still "only a movie". The key bonus feature is Michael Mayhew's documentary Voices From The List (78m), which is book-ended by comments by Spielberg. Produced by acclaimed DVD content producer Laurent Bouzereau, this re-tells the story of the film, through interviews with some of the eleven hundred people whose lives Oskar Schindler saved. It's primarily a talking heads documentary, illustrated with stills and archive footage. The Shoah Foundation Story (12m, the only on-screen title Survivors of the Shoah Visual History Foundation) promotes the work of the organisation that has taken video testimony from nearly fifty-two thousand survivors and witnesses to the horrors of the holocaust, in order to preserve their experiences, and educate new generations. (You can find the Foundation's website at www.vhf.org). Cast and Filmmakers is a collection of short text profiles of the principal cast and crew members. These are better than usual, but they offer nothing more substantial than you'd find on the Internet within a couple of minutes. About Oskar Schindler is a text account of Schindler's life story, and how his legacy came to be told by Australian novelist Thomas Keneally (who wrote Schindler's Ark, the book that the film is based on). The UK DVD appears to be almost identical to the US release. Both discs contain the same content. The US version is split across the two sides of a DVD-18 format disc. The UK version will be presented on a pair of DVD-9 discs. The American disc features two additional Dolby Digital soundtracks (in French and Spanish). This should mean that the UK disc has more space available for video data. Despite the disappointment with the almost total absence of behind-the-scenes material, it almost goes without saying that Schindler's List is a superb film, and Universal's DVD version is one that deserves a place in everyone's collection. The film will also be released as a Limited Edition Collector's Gift Set, which will contain a book, (Schindler's List: Images of the Steven Spielberg Film, featuring photographs by David James), the CD soundtrack, and a limited edition numbered film senitype, and certificate of authenticity.